Here’s your first proper look at The Last Viking Returns! The book will be out on September 1. Josh is as brave as a Viking warrior. And not much can scare a Viking. But when the two littlest Vikings go beserk, Josh, Grandpa and Viking World are in for a rocky ride. Here’s a sneak peek at the sequel to The Last Viking. Categories: Book trailers, classroom resources, The Last Viking 2, video | Tags: book trailers, Fremantle Press, James Foley, Norman Jorgensen, The Last Viking, The Last Viking Returns | Permalink. It’s here: an honest-to-goodness book trailer for The Last Viking. Everyone’s doing book trailers these days, so we thought we should too. Yep, that’s how Norm and I roll, so easily swayed by peer pressure. Categories: Book trailers, classroom resources, video | Tags: book trailers, James Foley, Norman Jorgensen, video | Permalink. Part 1- A book trailer? What’s that? Now that you’ve laid solid foundations, you get to do the fun part – actually creating your video! 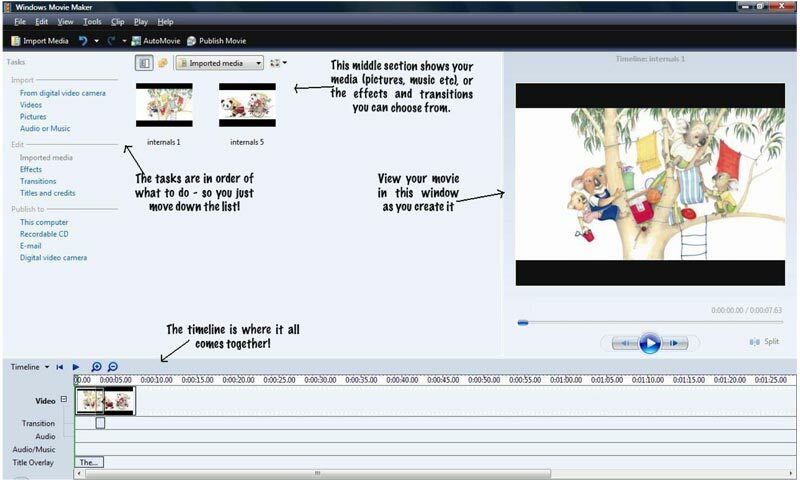 Find the video editing software on your computer. Even if you haven’t purchased Final Cut Pro, your computer will have something – on a Mac you should have iMovie, and on a PC you’ll have Windows Movie Maker. The latter two programs are pretty straightforward, but there are plenty of online tutorials if you need a helping hand. Following your storyboard, place the images in order along the timeline, then put your audio in afterwards. Now you can start to finetune the video, trimming the length of images and carefully placing text and audio. Once you’ve got everything in place and have played it back as a whole, you can add transitions and effects. Go easy on these – less is more, and consistency is important. Don’t forget to put a cover image at the end, as well as where the book is available from. Export your video as a movie file – and start spreading it around! Categories: Book trailers | Tags: book trailers | Permalink. Here’s part 2 of a series of posts from Kiri Falls, Emerging Arts Professional at Fremantle Press. If you missed part 1, see it here. Anyone who tries their hand at making a book trailer needs a plan – without it things get messy quickly. Your best tool is a storyboard. Don’t even think about creating your trailer without one. Here’s an example, but you can draw up your own rough version. Under each shot or scene, plot out where you’ll place text, music, or audio clips. You can play around with this structure as you go, but make sure you have an outline of your trailer before putting the video together. The other task at this point is to continue sourcing material – what are the elements of your trailer, and where will the images, music etc come from? Any text will, obviously, come from you (unless you want to use a glowing review, in which case remember to write where it’s from). The key to using text is to K.I.S.S. – don’t overload your viewer with words or they’ll tune out. source photos or videos from online stores – many require payment, but there are also ways to use free images. Note: make sure your images are 640×480 pixels or larger. Note: when using visuals and audio from other people, check the copyright! The creator may only allow certain uses if it’s free, or require that you attribute their work – be careful to check what you can and can’t do. Thanks Kiri. Next week is the last post in this series, where you’ll find out how to edit using Windows Movie Maker. Here’s the first of three posts from a guest blogger, Kiri Falls. Kiri is an Emerging Arts Professional on loan to Fremantle Press through the Australia Council’s OYEA Initiative. Kiri has kindly put together this series of posts to teach you how to put together a book trailer. So Kiri, what exactly is a book trailer? Good question. Well, think of all the movie trailers you’ve seen. They’re short, snappy, and they tell you a bit about the story but leave you hanging for more. They hint, they tease – that’s why trailers are sometimes called ‘teasers’. Book trailers have some things in common with movie trailers (and that may or may not include a deep-voiced American). Both show parts of the story, but don’t tell all. And both kinds of trailers use images, music, text, voiceovers etc. But before you go out and shoot a full-length film about a book just to make a trailer – there are some key differences to remember. Basically, a book trailer has more flexibility. It can use still images instead of video footage. It can use text in different ways, have voiceover or not and include reviews of the book, sound effects and music. It’s not limited to the book in the way that movie trailers are limited to their footage. 1. You need a single idea. What is the key message of the story? Discard subplots, description, shifts in setting, character development … things you might talk about in a review or synopsis of the book are not necessarily relevant to a trailer. 2. How will you convey this key message? Work out which elements you’ll use, i.e. still photos or video footage; voiceover or text. Can you animate any of the images? Think about the style of your book trailer and jot down ideas as you think. Keep in mind, your trailer should be roughly ninety seconds long. Any shorter than one minute and you won’t achieve much; any longer than two minutes and your viewer will get bored. 3. Watch other trailers. Check out trailers both good and bad – once you’ve seen a few trailers that bomb you’ll know what not to do! Thanks for the great post, Kiri. We’ll have part 2 and part 3 up over the next two Wednesdays. Categories: Book trailers | Tags: Australia Council OYEA Initiative, book trailer, Kiri Falls | Permalink.